M.Phil. (Tamil) is a one year course. Eligibility for the course is bachelor’s degree in psychology and intermediate cleared. Admissions for such course are on the basis of the scores of entrance test conducted by University of Madras etc. Students have to go through personal interviews also after clearing the entrance test to get admission into respective course. The tuition fees by average for M.Phil. (Tamil) comes between INR 4,000 to INR 1 Lakh for the span of one year. Major Job profile and designations for these graduates are Multimedia Reporter, Tamil Translator and Interpreter, Tamil Teacher, Tamil Linguist, among others. Graduates with this degree have opportunity for the industries like Banks, Business Houses, Consultancies, Educational Institutes, Fire Department, Economic Development, Export Companies, Foreign Affairs, Field Research Firms, Financial Organizations, Industrial Houses, Law Firms, Lobbying Firms, Management, Marketing Research Firms, Municipal Planning, Multinational Companies, News Media, Public Works, Publishing Firms, Political Organizations, Police, Tourism, and such. 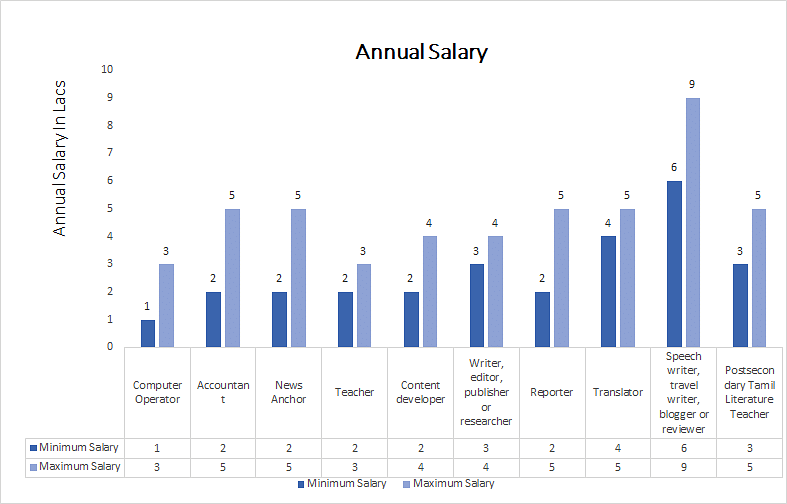 The average salary for M.Phil. (Tamil) graduates is around INR 2 to 6 Lakh but this can be higher on the basis of experience and other factors. Admission Process Based on counselling after clearing Entrance Tests for different colleges. Top Recruiting Companies Banks, Business Houses, Consultancies, Educational Institutes, Fire Department, Economic Development, Export Companies, Foreign Affairs, Field Research Firms, Financial Organizations, Industrial Houses, Law Firms, Lobbying Firms, Management, Marketing Research Firms, Municipal Planning, Multinational Companies, News Media, Public Works, Publishing Firms, Political Organizations, Police, Tourism, and such. Job Positions Multimedia Reporter, Tamil Translator and Interpreter, Tamil Teacher, Tamil Linguist, among others. M.Phil. in Tamil: What is it about? The department of Tamil Literature was formed to construct the cultural history of Tamil based on core Tamil Literature, core Tamil Grammar and the available archaeological sources like inscriptions and Tamil Manuscripts sources in the Tamil Milieu. M.Phil. in Tamil course also teaches contemporary cultural history on the basis of modern media and print audio and electronic operating today. Students learn about its evolution and contribution of various people for such a long period. Not only Tamil people have contributed but there are notable contributions from European authors also. Candidates also learn about political and social issues and details of different periods. This Tamil Course programme caters to the needs of adults who aspire to enhance their competence and knowledge levels in Tamil language and literature. Furthermore, courses on linguistics and translation have been incorporated to suit our local needs of our bilingual society. The language courses enhance students' understanding of linguistic concepts and language discourse from a functional grammar perspective. The literature courses offer an insight into a range of literary genres, periods and styles. The programme is taught by qualified lecturers and renowned foreign guest-lecturers. The common requirement for pursuing M.Phil.in Tamil course is Master’s degree in the respective subjects with at least 55% of the aggregate marks from any recognized university. Those students who are in their final year are also eligible to apply for M.Phil. in Tamil. The minimum age to get entry to this course is 22 years. The duration of M.Phil. in Tamil course is about 2 years. Master’s degree in the concerned subject with a minimum of 55% marks is the basic qualification required. Such candidates must have qualified 10 + 2 and graduation with at least 50% marks. Admission to the course is done on the basis of an entrance test. Written exam comprises of objective model questions of 100 numbers. Time allotted for answering this single paper test is 2 hours. Syllabus for the exam is based on master’s degree in the concerned subject. Most of the colleges arrange entrance test and interview for admission in M.Phil in Tamil. Yet few colleges like Kurukshetra University and IGNOU provide direct admission for acquiring distance-learning. Those who want to put up a career in teaching foreign languages can start earning in the range of INR 10, 000 to 20, 000 per month. Candidates working with embassies can receive a compensation of INR 8, 000 to 10,000 p.m. Translators are paid between INR 50 to 100 per page. Interpreters generally earn around INR 300 to 500 per hour.